Trump’s phone call transcripts show how hard it is to make deals with world leaders when you’re an extreme narcissist. 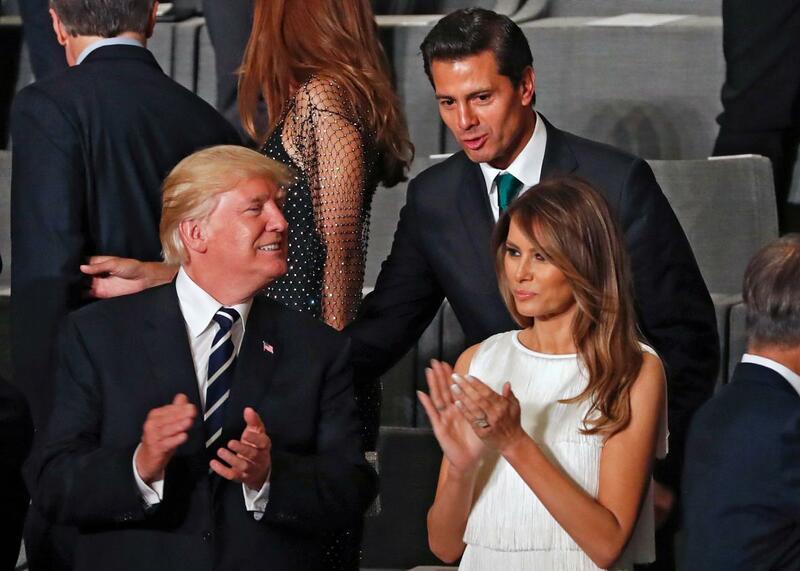 Mexican President Enrique Peña Nieto talks to U.S. President Donald Trump and his wife, Melania, on the first day of the G-20 economic summit on July 7 in Hamburg, Germany. It has long been obvious to everyone but the most credulous rubes that Mexico was not going to pay for Donald Trump’s border wall. The leaked transcript of Trump’s Jan. 27 phone call with Mexican President Enrique Peña Nieto—published Thursday by the Washington Post, along with a leaked transcript of a call with Australian Prime Minister Malcolm Turnbull—shows that this was obvious to Trump as well. Throughout his bombastic campaign, Trump presented himself as a tough and skilled negotiator who could extract concessions from recalcitrant foreigners. Many Americans who knew Trump from The Apprentice and who mistook reality TV for reality believed him. But once Trump got on the phone with Peña Nieto, he neither made demands nor offered an ingenious deal that the Mexican president couldn’t refuse. Instead, he wheedled for help in getting better press coverage, which has always been what he cares about most. It’s hard to know whether the Trump rallygoers who screamed about Mexico paying for the wall will find this disillusioning. Many probably won’t learn that Trump has essentially admitted to conning them. A July poll showed that only 45 percent of Trump voters believe that Donald Trump Jr. met with Russians for information about Hillary Clinton, a fact that is not in dispute. But for anyone who cares to pay attention, Trump’s mortifying conversations with foreign leaders should put to rest the idea that the putative author of The Art of the Deal is any good at dealmaking. Further, we can see from the transcripts that part of the reason Trump is such a bad negotiator is because of his extreme narcissism. When I went to Trump rallies during the presidential campaign, I would often meet people who knew that their candidate was an unpleasant person but believed his cartoon swagger would make him an effective leader. But Trump can’t make deals because he can’t see other people clearly, can’t understand their desires, incentives and constraints. He doesn’t seem to realize, for example, that he is deeply hated in Mexico—as he is almost everywhere—and that Peña Nieto has no interest in helping him burnish his image. Peña Nieto tells him that opposition to the wall is about the “dignity of Mexico and goes to the national pride of my country.” Trump, however, is incapable of empathizing with another’s wounded pride, much less trying to salve it. “It is you and I against the world, Enrique, do not forget,” Trump says, appearing to believe, as he so often does, that the leader of a nation he has repeatedly insulted nevertheless likes and respects him. It would have taken approximately five minutes for a reasonably competent negotiator to be briefed on why this issue was important to Turnbull, who campaigned on stopping refugee boat traffic to Australia. Turnbull tried to explain what he was willing to give in return: “Basically, we are taking people from the previous administration that they were very keen on getting out of the United States. We will take more. We will take anyone that you want us to take. The only people that we do not take are people who come by boat.” If Trump had the slightest idea of his interlocutor’s interests, he could have made a deal that would actually advance his own anti-immigrant policy goals. Instead, he whines about his image. “I look so foolish doing this,” he says. And then, growing increasingly irate, he adds, “I have been making these calls all day and this is the most unpleasant call all day. Putin was a pleasant call. This is ridiculous.” It is indeed.